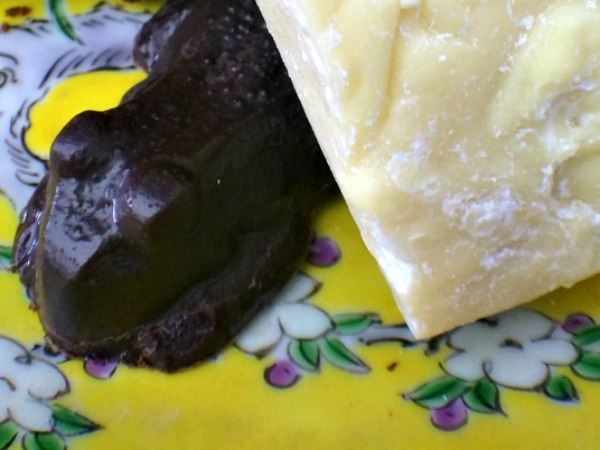 Homemade Chocolate with Cocoa Butter, what could be lovelier? I am not an impulse shopper. But this time something changed. 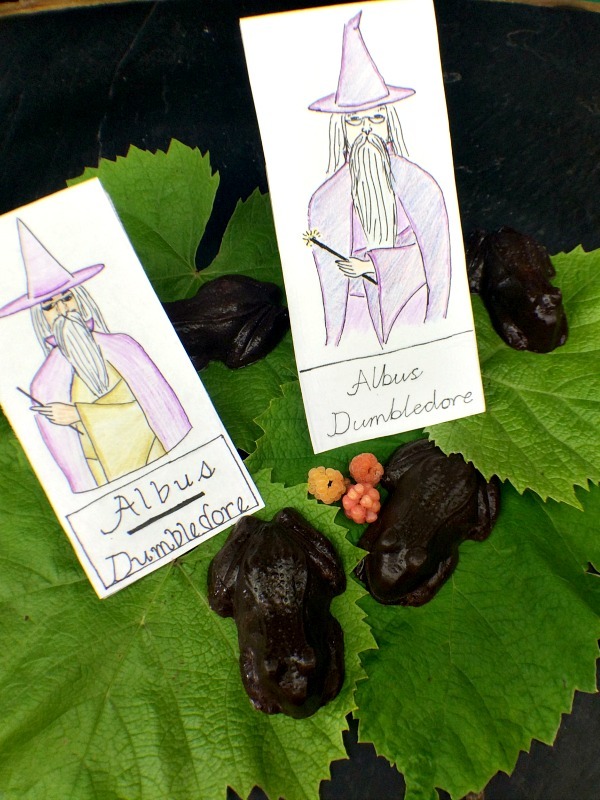 I was actually in the market for chocolate molds when I stumbled upon these chocolate frog molds. Yet the little rounds all looked so factory-made to me, for something so completely homemade! 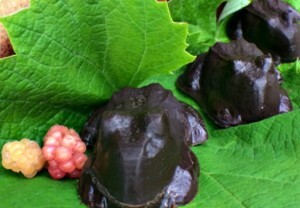 When I saw the frog molds something childlike inside me felt so excited. I LOVED them. 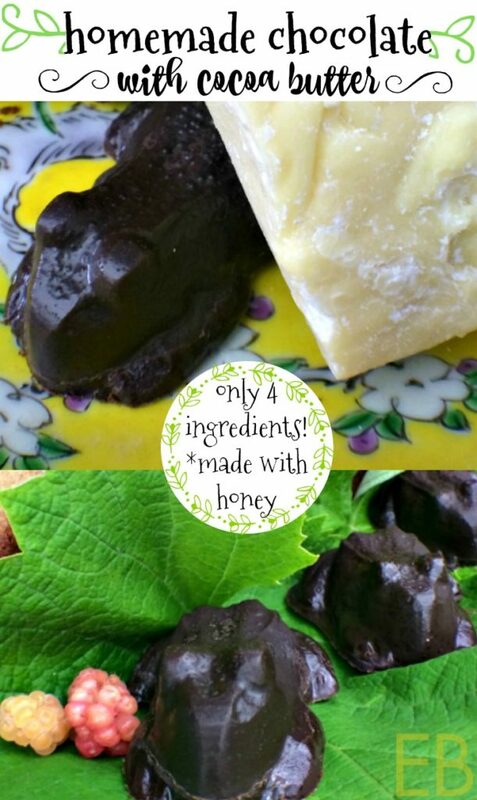 Homemade Chocolate with cocoa butter! There are only 4 ingredients. I never knew just how easy– nor how delicious– homemade chocolate was. By only using these four (no soy lecithin or other additives), you get such flavor! Honestly, I’ve been a dark chocolate snob for years and never tasted the perfume that comes through with this recipe. 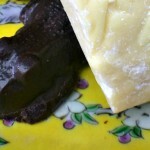 Raw cocoa butter (so nutritious, actually! ), fair trade cocoa, raw honey and pure vanilla. Sweet, bitter goodness. You may make solid chocolates with this recipe. There are even molds available to make slim chocolate bars! If you wish, you can also make truffles. This is done by filling the molds only halfway to start, putting a little surprise in, chilling, and then topping the filling with a final amount of chocolate. in half or in quarters. Yummy mint filling, no work. If you want something homemade and exciting, see below my Rooibos Chai Filling. It is delicious, nutrient-dense and caffeine-free. Coconut butter can be mixed with anything yummy to make a filling, yes! A bit of honey or stevia + any flavoring will work well: vanilla, peppermint, cocoa, teeny bit of orange oil, finely ground coffee, etc. Whoop! Love the creative options here! O, Darlings, chocolate making is so much fun; and easy!! Enjoy this magic. And, your loved ones will LOVE these. Make them as a love gift to share. You can buy raw cocoa butter here. Place cocoa butter chunk(s) or pieces into the upper insert of a double boiler, estimating how much you'll need to get one cup of melted cocoa butter. (Make sure no water touches the bottom of the pan or gets inside. 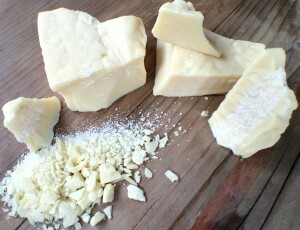 Alternately, place cocoa butter in an oven-proof pan and allow it to melt slowly in a 200 degree oven.) Melt cocoa butter, measuring out 1 cup as it melts, and adding more to melt, as needed. Place melted, measured cocoa butter into a medium size mixing bowl. Add remaining ingredients: cocoa, honey and vanilla. Stir or whisk to mix well. Fill molds 1/2 way if you plan to fill them, or fully if you wish them to be solid chocolate. For filled truffles, carefully add 1/2-2 tsp. filling (depending on mold size) into the middle of each mold. Refrigerate this stage for 30 minutes. To slightly chilled filling, add remaining chocolate, up to 1-1/2 T. more for each mold, to form the base of each chocolate truffle. Refrigerate the mold to fully harden the chocolates. After a minimum of 3 hours, unmold. The chocolates are now ready to eat or may be stored at a steady room temperature. Place coconut butter into medium-size bowl. Add honey, vanilla and 2 T. chai, measured from Base Instant Powdered Chai Recipe (below in Recipe Notes). Stir well to mix. Set aside. After making your chocolates, protect them from fat bloom. Fat bloom occurs when chocolate is exposed to fluctuating temperatures, rising above 75 degrees Fahrenheit and then dropping in temperature. The cocoa butter rises to the surface in this situation and speckles the surface with white spots. Well-sealed, cool, dry storage helps to prevent fat bloom. Place all chai ingredients into small bowl. Stir to combine. We made this chocolate and it is DELICIOUS! 🙂 Thank you for the recipe! Our honey has quite a strong flavour, which came through in the chocolate. 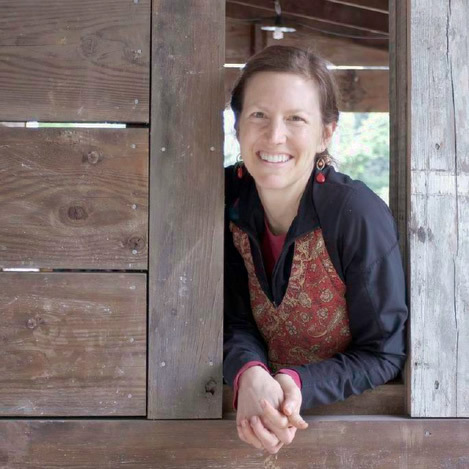 My favourite sweetening agent is maple syrup – I’m curious to know if you’ve tried making this recipe with maple syrup, and if so, was it good?? I’d like to give it a try next time! Would you please share what the measurements would be in weight/grams? It would make it a little easier to deal with the cocoa butter that way, since I melt the honey with it. Thanks. Hi Denise, yes, I’d be happy to! It will have to wait, unfortunately, until I make this recipe again. But then I’ll update it! Nope. 🙂 You just heat it gently to melt. So they won’t stay hard at room temperature then? Yes, they do. Warm fingers holding them will begin to melt them. But they will keep best in the fridge or a cool house. Hi Megan! This recipe looks wonderful!! Im currently out of honey but would you be able to use stevia at all? How much powdered or liquid would you recommend? I can’t wait to make these!! Hi Brittney, thanks for the question. It’s certainly possible, but because I haven’t yet done it, I hesitate to guess. I’d use the standard “to taste” model in this case and see how it goes. I would start with 8 drops, if it’s NuNaturals brand, which is what I work with, and then increase from there. I have read online that if you don’t “temper” the chocolate the end product, while okay, is inferior. It doesn’t look, act or taste like the genuine article. The online authors state that tempered chocolate has a dull gloss and “snaps” when broken or bitten, and it doesn’t quickly melt on the fingers when held. It acts just like high-end store-bought chocolate. I am new to this. I have tried a similar recipe and did not temper. Shared the results with some friends to sample. They were disappointed with the result. Gotta say, I was disappointed too. Next time, I’m going the extra mile and temper it. Hopefully I’ll make a more palatable – professional – product as a result. It has come out very well ! Taste is very good! The problem I am facing is as soon I take it out of refrigerator it melts down ! Let me know how to keep it hardened ! Hi Rakhi, this recipe does need to remain chilled until you eat the chocolates. When ever i mix coco butter with coco powder it starts to go pasty and harden. Hi, this means there is a small amount of water or even steam getting into your cocoa butter as it’s melting, or that the heat is too high. So use very low heat, and make sure no water gets into your pan. Hi Megan, if I needed to temper this mix, can I do it? Any tips on how to temper chocolate made from cocoa butter and cocoa powder? Hi Anne, the main issue with tempering is slowly heating and quickly cooling. 88 degrees is the ideal temp for the right kind of beta crystals (small) to form from the cocoa butter. So melt the cocoa butter over very low heat, and then cool it in the fridge as the recipe directs. While this is not official tempering, my goal with this recipe was to take away the thermometer and make the whole process less fussy and more accessible. If you want tempered chocolate then that’s another option, to find a recipe that actually uses a thermometer. Thanks for your question! Have you tried this with no sweetener? We have gotten used to the taste of 70%+ dark chocolate and I try not to add honey, etc if not strictly necessary. I used to make a version of this with raw agave, but I think it would be too sweet for us now. Hi Terri, I haven’t excluded all sweetener before, but I like the idea of adding less, to taste.